The Water Warriors Armor-dillo is an interesting water weapon. It does not quite qualify as a soaker as the Water Warriors Armor-dillo is 100% hose-reliant. 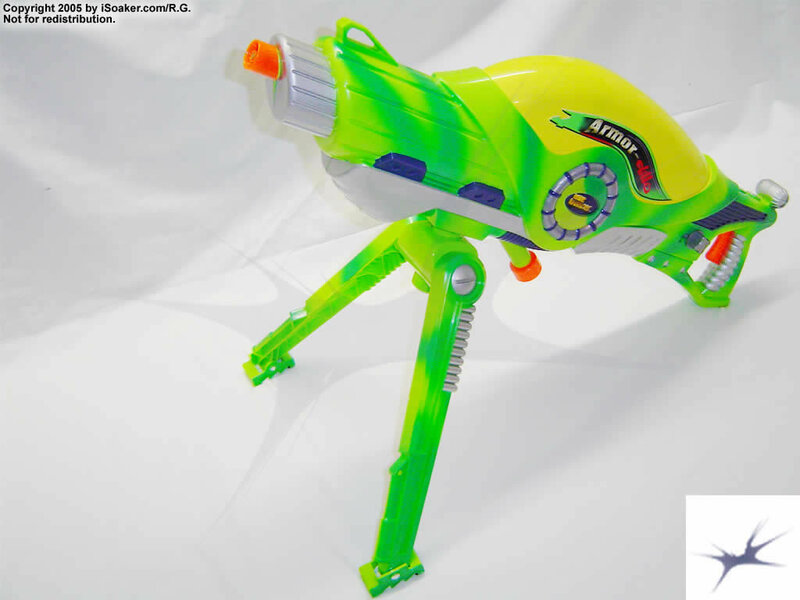 Unlike soakers such as the Super Soaker SC Power Pak and Super Soaker CPS Splashzooka that require a hose to fill, but function independantly, the Armor-dillo derives its water capacity and pressure purely from the hose it is attached to. As such, the power available to the Armor-dillo is also dependant on the water pressure a given hose can supply. For sake of argument, the Armor-dillo is a fancier hose nozzle attachment. However, it does offer some interesting features. Styling aside, the Armor-dillo sports a collapsible bipod that tucks neatly beneath its body. The bipod legs snap into either up or down positions and can also swivel to some degree. The feet on the bipod can also adjust slightly to uneven terrain. The hose is attached to the input port at the base of the unit. This connection must be secured well, otherwise the pressure from a good strength hose will likely cause this area to leak or mist. Shots from the Armor-dillo are controlled by the rear-mounted trigger. 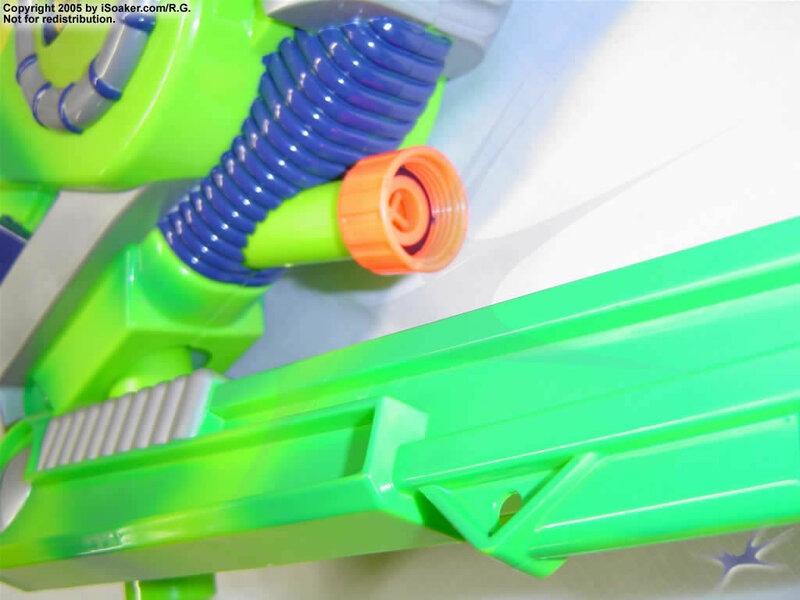 It also features three spray settings that are controlled by a grey lever-knob near to the trigger. The forward two settings on the knob result in the stream taking on a spread pattern. However, when the knob is set to the last position, the Armor-dillo fires a non-spreading stream. The advantage of using the Water Warriors Armor-dillo as opposed to just a standard hose attachment appears to be in a slight range improvement on stream setting. Testing here resulted in a 3m improvement in range when using the Armor-dillo compared to a standard garden nozzle attachment. 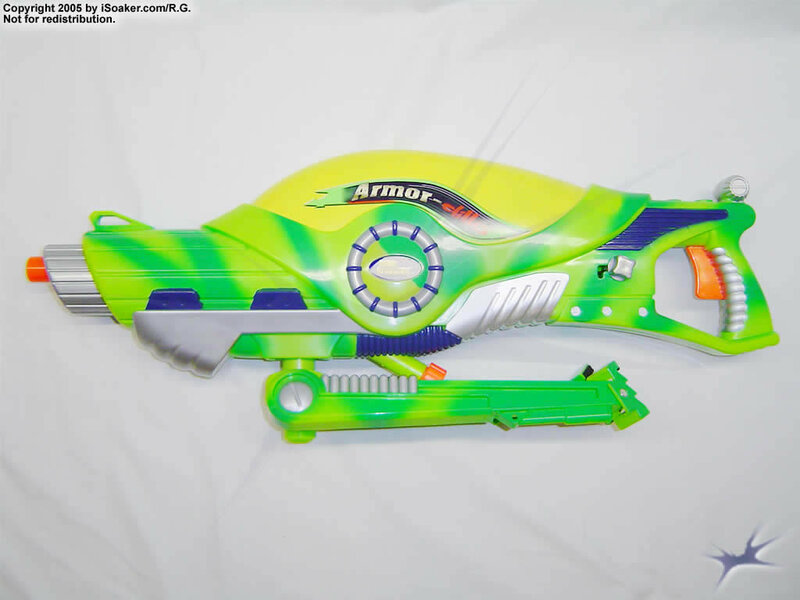 As well, the Armor-dillo also looks more like a soaker, thus may be more acceptable for use in battles. Of course, having the power of a hose attachment means the Armor-dillo user need not worry about conserving water. However, he/she is limited by the reach of the hose. Slight range improvement over tested garden attachment. Nice styling, easy to switch nozzle settings. Completely hose dependant. Connection to hose a little tricky to fasten securely without water spraying or leaking from the attachment.